November is one of the few months which come loaded with festive fun, music and cultural extravaganza. Among the upcoming Indian events in Dallas in November 2017 are live music sensations by Vidya Vox, Neha Kakkar and Richa Sharma. DFW Diwali Mela and Antar Yatra by Sharmila Biswas are two most-awaited events for Indians in and around Dallas, Texas. We at Indian Eagle, a trusted travel booking partner of Indians in USA, have briefed some of the best events for Dallas Indians in November 2017. Be ready Dallas Indians! YouTube sensation Vidya Vox is coming to rock Irving on November 3 with her electrifying music. Born in Chennai and raised in Virginia as Vidya Iyer, she is an emerging Indian American singer having a rare distinction of performing in the White House. Dallas Indians can hold on to their breath until Vidya Vox transports them into musical reverie with her repertoire, which is a mélange of Indian and western songs, at the live concert. No wonder if Viday Vox show in Irving has made it to the top on our list of Indian events in Dallas in November 2017. DFW Diwali Mela is a most-awaited event on the calendar of Dallas events 2017. Dallas Desis will have a double Diwali blast at the DFW Diwali Mela on November 4 this year as a galaxy of Bollywood stars including Sufi Queen Richa Sharma will grace the event. Besides Richa Sharma’s Sufi melody, laser show, firework, delicious Indian food and fun activities for kids are on the agenda of DFW Diwali Mela 2017. Wait! There’s more. Indians in Dallas, TX will also witness to such spectacular shows as Ram Leela and Ravan Dahan. While the spell of Vidya Vox’s concert in Irving will be lingering, Neha Kakkar will reignite the embers of excitement among Dallas Indian Americans on November 10. A Bollywood music sensation, Neha Kakkar will be accompanied by her siblings – Tony Kakkar and Sonu Kakkar – who are singers too. Given the increasing popularity of Neha Kakkar and a growing demand for her shows, we couldn’t help adding the Neha Kakkar Live-in-Concert to our list of Indian events in Dallas in November 2017. AIM for Seva presents “Antar Yatra” by Sharmila Biswas in Garland, Texas. 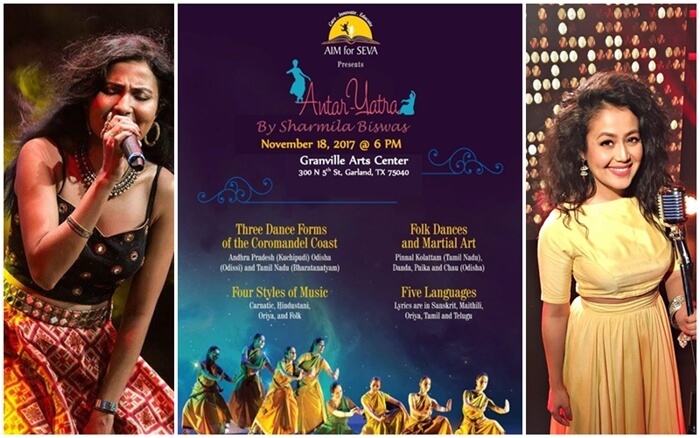 To be held on November 18, Antar Yatra is a rare mélange of three classical dances, three folk dances, four music forms and five languages from the East Coast of India. One of the few exclusive events for Indians in and around Dallas, Antar Yatra by Sharmila Biswas will hold a mirror to the Oriya, Tamil and Telugu cultures of India. The November 2017 Indian events in and around Dallas include the Teens, Miss & Mrs. Bollywood USA South Pageant in Austin. To be held on November 11 and 12, it is open to all South Asian communities in the US. The pageant has three main categories – Miss Teen Bollywood, Miss Bollywood and Mrs. Bollywood. Three winners, one from each category, will represent their respective city or state at the Bollywood Pageant International Finals 2018 in Houston, Texas. The month of November is somewhat special for Indian women in the Greater Dallas Fort Worth Metropolitan Area as the Dallas Indian events in November 2017 include a ladies-only night in Plano. Cash prizes being available for five best dressed women at Diva Night, Indian women in and around Dallas, TX will surely have the best night out. Popular DJs will define the mood of the night. Travel Beats, a leading Indian American community magazine by Indian Eagle, publishes the latest travel, tourism, visa, immigration and community news. Subscribe to our free newsletter for the latest updates and airfare alerts for cheap airfares to India from Dallas, Houston, Irving, Austin, Frisco, San Antonio and other cities.